August saw the sun retreating across the UK but there was no lack of warmth at the Isha Yoga Centre, all thanks to the glowing kids who gathered for the Yoga for Children Workshops. These sessions have been a roaring success, with two programmes being conducted this month alone. The rapturous laughter and giggling of the children brought out everyone’s inner child! The euphoric buzz was so electric that the parents couldn’t resist joining in, with several remarking they hadn’t been so playful for many years. Volunteers joined in the fun by playing impromptu games and starting pillow fights with the kids, only to be eventually told off by the strict coordinators! This month also saw the center welcome 20 committed Sadhanapada participants everyday to do their practices. Their continual presence has brought a wave of dedication and devotion and our space has become more lively and focused because of them. They have created an Isha family, right here in the heart of busy London. Our most recent IE Total was not only fully booked but we had many interested newcomers come to listen to the free intro talk on the first evening. The participants were open and receptive from the outset, and even though they were cramped for space during meals their smiles made it clear as to how much they were enjoying the programme. As summer draws to an end new programmes at the centre will bring light in September. 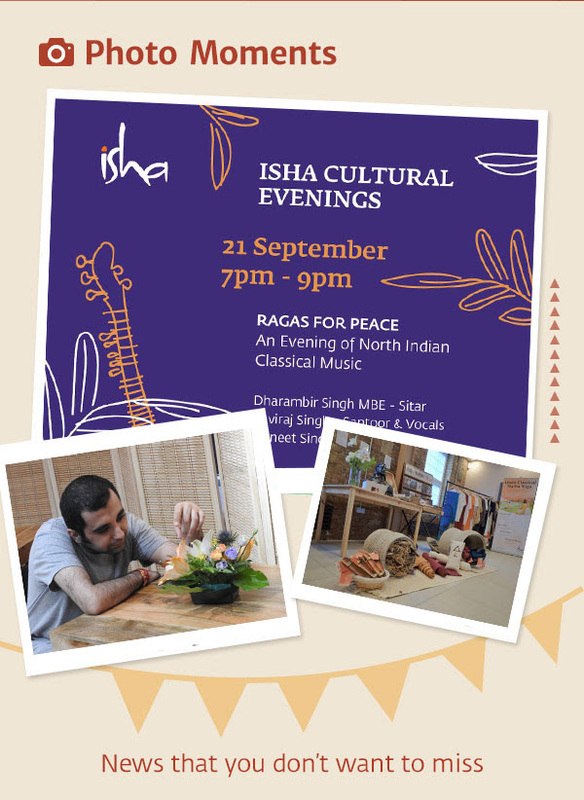 One of the most exciting events will the be Isha’s first Cultural Evening - Ragas for Peace. This event, the first in a series of Cultural Evenings, will be an evening of North Indian classical music featuring a line up of renowned artists who are offering their music as a donation to the center: Kaviraj Singh on vocals and the santoor, Dharambir Singh on the sitar, and Upneet Singh on the tabla. We are looking forward to this magical night which will fittingly be taking place on the 21st of September, the International Day of Peace. While the 21st may perhaps be the biggest event of our month, there are other programmes, many of which are being offered for the first time, which we would encourage you to take the opportunity to explore: Sadhana of Devotion, Shanmukhi Mudra (the Beautifying Kriya), Eye Care Programme and the Food for Wellbeing Workshop will all be happening in September. It is an incredible gift that these programmes are available and it is our sincere hope that you may benefit from all that they offer. We will also be offering free lunch time Isha Meditation Sessions every Wednesday, Thursday and Friday from 12.30pm -1.15pm. Please encourage anyone who may be interested. Isha Institute of Inner Sciences (part of Isha UK, charity no. 1116816) has now been registered on SmileAmazon. When you wish to purchase anything from Amazon please go to SmileAmazon, select Isha Institute of Inner Sciences as your chosen charity and then continue with your shopping. Amazon will donate 0.5% of the net purchase price of eligible purchases to Isha UK. Produced in the heartland of India, Isha products provide a fantastic outlet for remote rural communities to share a taste of their culture and spread their mystical traditions the world over. We are delighted to announce that our burgeoning Isha Shoppe at the centre has been restocked with new produce such as Banana Fibre yoga mats, Copperware, Kailash water and more. Please visit the centre soon to check out the new items and help enrich the lives of rural population. ‘Being stressed out’ means your mind is in a state of psychological friction. If the body is to function with ease, it is important for everything within your system to function with the least amount of resistance or friction possible. Sadhguru explains that the idea of hatha yoga is to knead the system - not just the physical body - to knead the whole system in such a way that all these frictions are smoothened out. Then you have only the outside to deal with, nothing else. Only if your system becomes like that, can you deal with the outside world with a phenomenal ease and capability. Through the year we have witnessed a great rise in the number, attendance and variety of programmes at the centre. From January onwards, we have hosted 23 Inner Engineering programmes in which almost 450 attended. During this time there were 69 Hatha yoga classes with a grand total of 685 attendees and on top of this, 39 Free Offering sessions with approximately 350 participants. All programmes and events within Isha are volunteer run. It takes tremendous a level of effort to make this happen, and they're only possible as a direct result of volunteers' love and dedication. 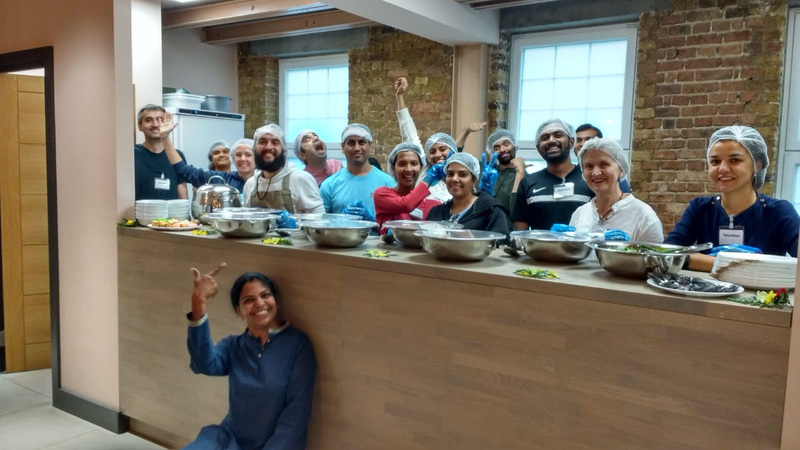 As the number of programmes and events offered at the Isha Yoga Centre in London grows, so too does the need for the continuous support from volunteers both to run Isha’s inspirational programmes and to maintain the centre as a joyful and energised space. If you wish to volunteer, please fill in this survey or get in touch with us on volunteers.uk@ishafoundation.org. We hope you will take advantage of this wonderful growth opportunity. We have been able to establish the centre after more than 10 years of continuous efforts thanks to the goodwill and support of Isha meditators. It is now poised to lead the way in offering the powerful tools of yoga to raise human consciousness across Europe. You can support this endeavour by donating towards the running costs of the centre. Your donation can be on a monthly basis, or as a one-off contribution. No matter how big or small the contribution is, every penny will go a long way in helping the centre to thrive and expand. If you are UK taxpayer, your donation is tax free and eligible for Gift Aid. Please make your contribution by clicking here. “The motor of the mind roared up and down on every occasion of perceived success and near misses only to realize now that it was all in the mind, and has made little good to the world around me. Responsibility took a whole new meaning after the inner engineering. So much can be done, but for the mind stuck in illusions of success and failures. Taking a fresh look at life to live and not just to survive”.